Preformed Thermoplastic is a durable pavement marking system where thermoplastic lane lines, legends and symbols are supplied pre-cut and can be easily installed without the use of expensive equipment. Preformed thermoplastic pavement markings combine the convenience of pre-cut markings with the performance qualities of hot applied thermoplastic. Engineered for enhanced visibility both day and night, RAE's Preformed Thermoplastic Pavement Markings are made with brilliant Swarco glass beads which are distributed throughout the material during the manufacturing process. Preformed Thermoplastic is distributed and used worldwide and is considered one of the most durable pavement markings available. Specification - AASHTO M-249, AASHTO T-250, ASTM D 4592, ASTM E 303, ASTM E 1710, ASTM D 6628. 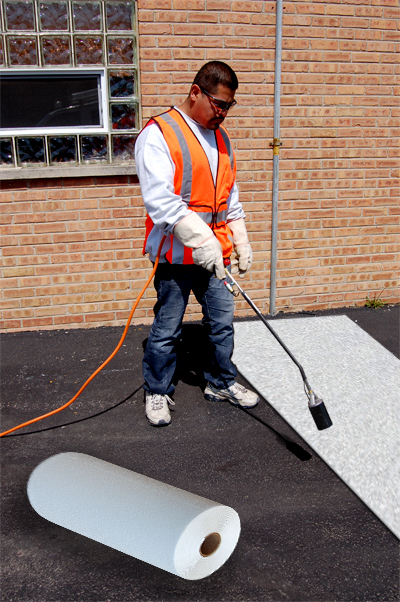 Color - Our pavement marking materials conform to standard traffic marking color requirements. (ASTM D 6628).FHWA Standard MUTCD. White 400 min mcd/sq ft/lux. Yellow 250 min mcd/sq ft/lux. Due to the nature of the installation method, installed retros can vary from one installer to another. Skid Resistance - Minimum Initial BPN>45 (ASTM E 303). Storage - Preformed thermoplastic should be stored horizontally and indoors at temperatures between 50° F (15° C) and 100° F (38° C). Environmentally friendly with zero VOC and heavy metal free pigments. Proper surface preparation is essential to obtaining consistent adhesion of the road marking tape. The surface must be free of loose or caked dirt, gravel, oily residues, salt residues or other foreign materials. Thoroughly read application instructions prior to use or contact a RAE Products sales representative at 1-877-275-7550.